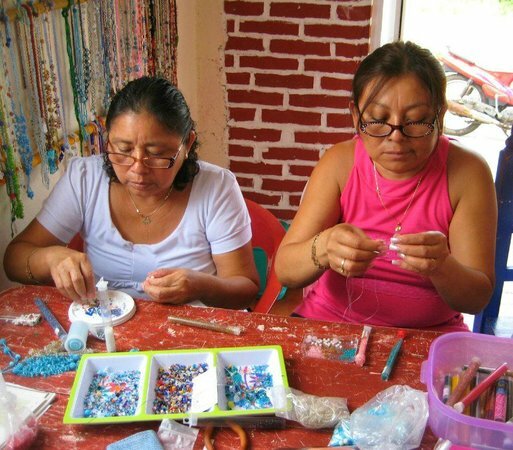 When you are on Isla, be sure to visit the Isla Women’s Beading Cooperative in the colonia (neighborhood) of La Gloria, located mid island (see the map at this link) . This group of amazing artists (57 women more or less) create one of a kind handcrafted beaded jewelry… necklaces, earrings, bracelets, purses and more. Their work is very high quality, the kind you would find in a juried craft fair. If you stop by during the storefront’s hours, you will almost always meet a group of the women beading around a table. Each woman earns a percentage of the sale of one of their pieces, with a percentage going back into the cooperative to buy beads and other supplies. The cooperative is open Monday through Saturday, from about 9 am – 5 pm. If you are taking a taxi, ask for “el Taller Artesanias de Mujeres al lado de Cruz Roja y la Iglesia Corazon Sagrado.” (The Store of the Women Artists that is next to the Red Cross and across the street from the new Catholic Church). The public bus goes right by the cooperative also. If you are renting a golf cart from el centro, drive south on Reuda Medina (the western perimeter road) until the Mundaca pavilion, then turn left (west) on the newly paved divided road. The store is a few blocks west on your left. You can’t miss it! If you see the Little Yellow Schoolhouse on the left, then you have gone a block too far. For pictures of the women’s handcrafted beaded jewelry, please click on this album.